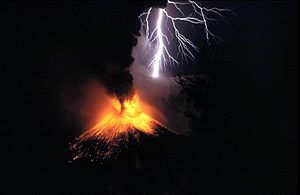 Met Office researchers have published new findings in ERL suggesting that the amount of lightning produced near a volcano each hour is roughly proportional to the plume height. They believe that the technique could ultimately be used to monitor volcanoes in remote locations or those that are obscured by rain. To assess the number of lightning strokes the team used ATDnet, the UK Met Office‘s long-range lightning-location network, which has recently been updated. Bennett and colleagues from the UK Met Office and Icelandic Meteorological Office found that plumes from Eyjafjallajökull that reached about 5 km above sea level generated lightning strong enough to be detected by ATDnet. Above this threshold, the rate of lightning production was approximately proportional to the plume height. An eruption of Iceland’s Eyjafjallajökull volcano in late-March 2010 produced a large plume of ash and considerable disruption to flights across Europe. The team used C-band radar data from the Icelandic Meteorological Office to quantify the plume height above the volcano. This allowed the scientists to combine detailed observations on lightning and plume height as well as modelled atmospheric parameters, such as wind speed, wind direction and ambient temperature. “With these data we can begin to quantify the effect of plume and atmospheric conditions on the generation of volcanic lightning,” said Bennett. This entry was posted in Met Office News and tagged Eyjafjallajökull, Iceland, Lightning, Met Office, volcano. Bookmark the permalink.